A thyroid nodule is a growth (lump) in the thyroid gland. 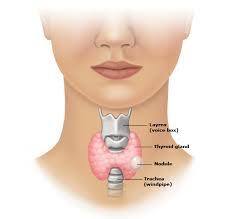 The thyroid gland is located in the neck. Thyroid nodules are very common and occur in up to 15 to 30% of the US population. Like most thyroid diseases, they are more common among women than men. The chance of having a thyroid nodule increases with age and by the time. By age 60 a woman has a 60% chance that she will develop a thyroid nodule. Although many thyroid nodules can be felt by the patient or by a doctor during physical examination, more and more nodules are being discovered incidentally during an imaging test ordered for another reason (like a carotid ultrasound, Neck MRI or Neck CT scan). Is the patient hyperthyroid (do they have too much thyroid hormone in their body)? Fortunately, most thyroid nodules are benign (not cancer) and non-functional (not causing hyperthyroidism). Only 5 to 10% of thyroid nodules will end up being cancer. Thyroid nodules are more common in women than in men. A person’s chance of getting a thyroid nodule increases with age. Most thyroid nodules do not cause symptoms. Noncancerous thyroid nodules are not life-threatening. Many do not require treatment. Follow-up exams are enough. 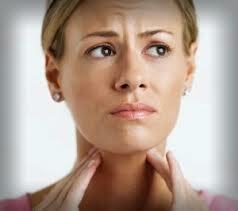 Patients with nodules that are making too much thyroid hormone (Toxic Nodular Goiter) need medical treatment. It is best to consult an endocrinologist to find the best specific treatment for each individual patient with hyperthyroidism (overactive thyroid). The outlook for thyroid cancer depends on the type of cancer. With most common kinds of thyroid cancer, the outlook is often very good after treatment. Thyroid cancer requires medical treatment by an endocrinologist who may refer high risk cases to a more specialized facility for care. Call your health care provider if you feel or see a lump in your neck, or if you experience any symptoms of a thyroid nodule. A neck ultrasound can be done to look for thyroid nodules.